Being cooped up indoors makes our vitamin D levels drop at this time of year and also makes us much more susceptible to coughs and colds. Experts say that people spending more time indoors together is one of the reasons why we catch more bugs in the winter. Workplaces contribute to the problem because they involve a significant number of people working in close proximity, often sharing devices and desks, making it easier to pick up each other’s germs. With sickness absence costing around £500 per person per year, it makes financial sense for businesses to promote good health practices and ensure the workplace is equipped to combat infection. Handwashing is huge in the fight against infection. 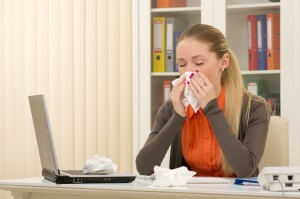 If just one person comes into work unwell, their virus can spread through an office in two to four hours, infecting 40-60% of workers and visitors in that time. All it takes is for the sick employee to shake another person’s hand, or touch a shared surface, for infection to be passed on very easily. Employers who want to cut sickness rates and improve productivity should promote handwashing across the board, not just among food or care workers. Employees should use soap and water after visiting the washroom, before eating or handling food, going into meetings, on returning to the office or using shared equipment. Carex Hand Wash comes in 250-500ml sizes and includes antibacterial and moisturising ingredients designed to kill germs and leave hands feeling fresh and clean. 2Work offers a selection of wall mountable soap dispensers that can be bulk filled for busy washrooms, including a choice of eco friendly formulations. Bacteria rests on equipment, such as keyboards, telephones, headsets, touch-screens, desks and printers and this is spread via coughs, sneezes and hands. Germs can live on surfaces for around 24 hours, which means anyone transmitting bacteria to a phone receiver, touch screen or keyboard can pass on a cold or tummy bug easily. Keeping and using cleaning wipes on your desk, devices and telephone regularly will only take a matter of seconds and could save you and your colleagues several days of illness. If you use a hot desk then this matters even more. AF International offers a range of device and telephone cleaning wipes including AF Phone Clene, antibacterial wipes which are quick and easy to use on phones and kill germs for up to 24 hours. Dettol Antibacterial Surface Wipes are safe to use in a wide range of areas including food preparation as they are non-tainting and unperfumed. Providing boxes of tissues to workers is not purely an act of politeness. By ensuring everyone has tissues on their desks, they’re more likely to use and bin these, rather than getting germs on their hands which will end up on shared surfaces such as door handles. Kleenex tissues come in boxes, cubes and a unique oval shape, with 2-ply or 3-ply tissues that can be kept on desks and used in a variety of environments. Kleenex Balsam tissues have a balm containing calendula that prevents noses from drying out and becoming red or sore. Wrapping up warm and getting outside for some fresh air at lunchtime is not just a good way to escape the workplace for a little time but also brings big health benefits. Regular exercise helps to control weight, boost our immune systems and is a good way to de-stress in the middle of a busy day. It’s easy to hibernate behind a desk in the cold winter months, but try not to fall into this trap. Put on your coat and gloves and make the most of whatever outdoor space is near to work, whether that’s doing fast walking circuits around an office park, hotfooting it to your nearest green space or speed walking along city streets. If people are working or travelling in darkness then consider equipping them with high visibility vests or jackets from the VOW catalogue. Posted 12:40 pm by Darren Phillips & filed under Facilities Supplies.